Start 1-2 hours before by placing the yoghurt in a sieve lined with muslin. Place the sieve on top of a bowl and refrigerate. Preheat the oven to 170C. In a bowl, mix together the almond meal, baking powder and lavender. In another bowl lightly whisk the eggs, and mix in the apple sauce, vanilla and honey. Pour the egg mixture into the almond mixture and stir until smooth. Spoon into muffin cups and bake for 15 minutes or until a tester comes out clean. Let cool. Take the yoghurt out of the fridge and discard the whey. Place the yoghurt in a bowl and add in vanilla and honey. Mix until smooth. 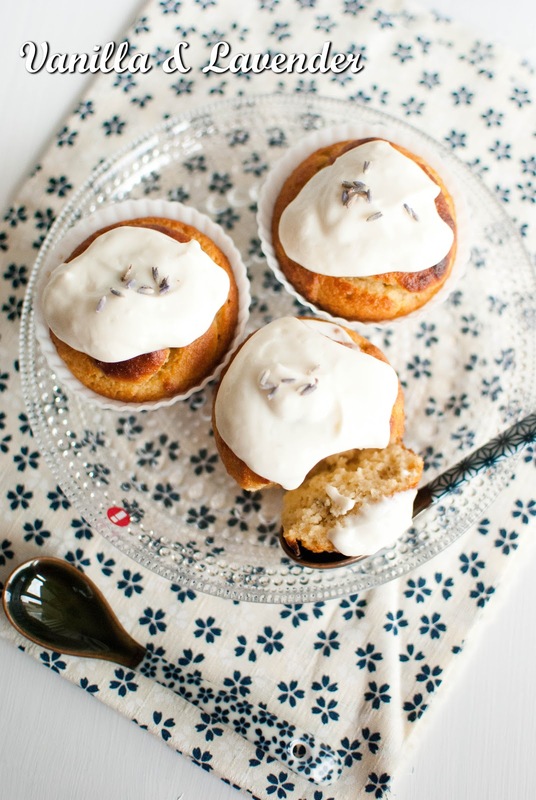 Top the cooled muffins with yoghurt icing and sprinkle with extra lavender flowers to serve. Oh they look so yummy, I like your recipes. We have french lavender in the garden, can I use that? It hasn't been sprayed. 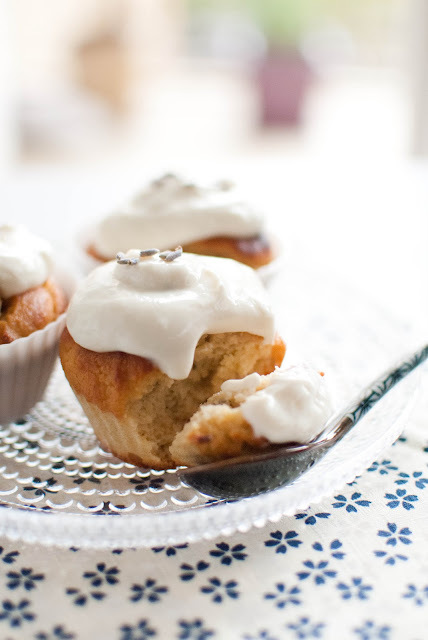 Cute muffins, love the yogurt and honey icing. A recipe for keeps. These look so pretty and the icing with the lavender just lifts them into the really special. I've bookmarked this one - I love a good low fat muffin. I can almost smell the muffins, Maria! These are precious! I love the idea of a yogurt icing - much healthier! There IS no better way to start the weekend! Love the yogurt icing recipe. I could just spoon that up! I have to admit that lavender scares me as a flavour. To me it's more a handcream or potpourri! I had a lavender cupcake one time at Sparkles in Surry Hills and I almost threw up cos it was so strong hehehee. Of course I think you'd use just the right amount, but I'd just be too scared to try!! Love lavenders, and that yogurt icing looks delish. I can't believe these don't have any butter in them. These are rare muffins and they looks so pretty with the lavender flowers on top. Honey yogurt icing just sounds like a good idea all around. I have some friends who are gluten-free and I am always looking for delicious desserts to serve to them! These look so delicately decadent! Perfect for tea. Such pretty flavours, and I like how they're healthy muffins too! Your recipe is so yummy and your pictures are so "Nordic zen" ! I love them ! You make lavender muffins? 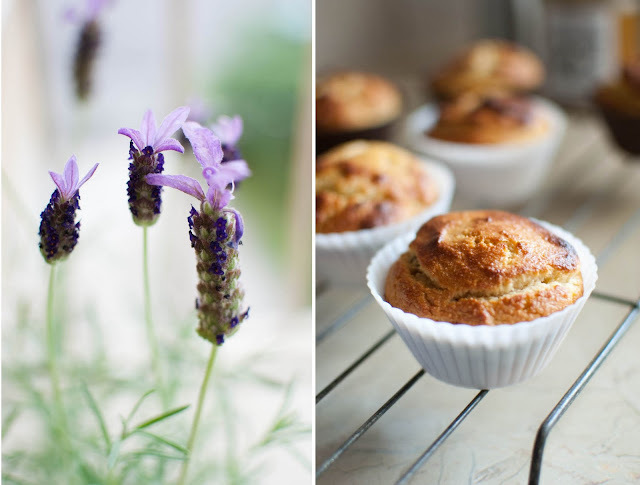 I make lavender biscuits and lavender madeleines... j'adore la lavande! And I like your blog! Wow, I will have to try making these! They look too good to be true!